« One Hundred Years Later….Eye Color Genes "Visualized"
The discovery of fossils is an exciting link to our past. 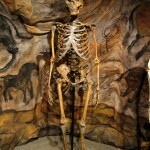 Although the fossil bones do contain DNA, much of it is contaminated. Dr. Emily Hodges at the Cold Spring Harbor Laboratory developed a technique to quickly identify and amplify specific portions of contaminated DNA accurately. Referred to by her team as ‘array capture re-sequencing’, the procedure uses regions of human exons (lengths of DNA that code for proteins) to probe for (or fish out) the Neandertal exons from contaminated DNA samples. Through the technique they were able to identify 88 differences (in a total of only 83 proteins) between human and Neandertal protein sequences. Amazing! Print article This entry was posted by Erin McKechnie on May 19, 2010 at 9:58 am, and is filed under DNA From The Beginning. Follow any responses to this post through RSS 2.0. You can skip to the end and leave a response. Pinging is currently not allowed.